From here, this looks like a typical 65 ES-355 mono. But it isn’t. Everybody knows the urban myth that ’68 Les Pauls were supposedly made from leftover bodies from the 50’s and most of us know that it isn’t actually true. But there are guitars that don’t seem to reflect the year in which they were shipped. It’s actually easy to identify these “leftovers” up until 1961 because the guitars were stamped with a factory order number when the guitar’s build was initiated. A good example of this is the 62 block neck I had not long ago with a 1960 FON. It had a number of earlier characteristics that would have indicated it was a leftover even if it didn’t have an FON to prove it. The body depth was thinner (like an early dot neck) and the neck angle was very shallow. It also had a finish flaw that added some credibility to the leftover concept. One could assume it was somewhat poorly painted (which it was) and was put aside and used either when needed like when someone ordered a solid color and it could be painted over or when they had more orders than they had bodies ready. Once Gibson discontinued FON’s, it gets a little trickier. That’s where knowing the features of the various years becomes valuable. My example is a ’65 ES-355 mono. The serial number is relatively early in the year, perhaps February or maybe March but the guitar presents itself as a 64, judging by its features. But didn’t early 65’s have a lot of 64 features anyway? We all know about big neck 65’s-some even with stop tails and nickel parts. But this is a little different. By 1965, a 335 is a very high volume guitar for Gibson. Not as high as a Melody Maker but still, a lot higher than a 355. 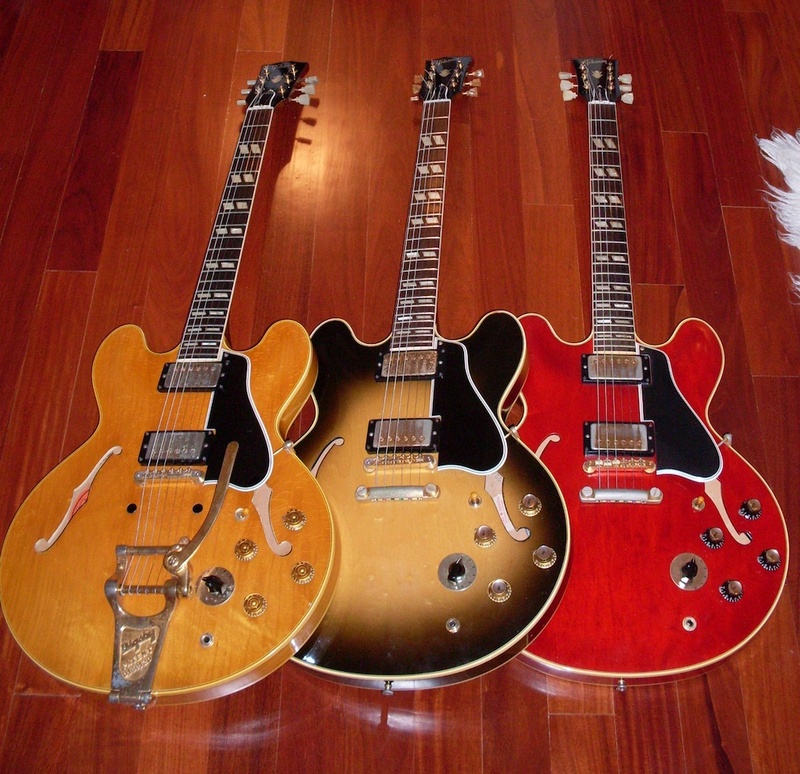 In ’64, approximately 1250 ES-335’s were shipped. Only 54 1964 ES-355 monos exist though. So, finding a 65 with 64 features doesn’t seem far fetched at all since Gibson’s bean counters must have anticipated a few more sales than that. 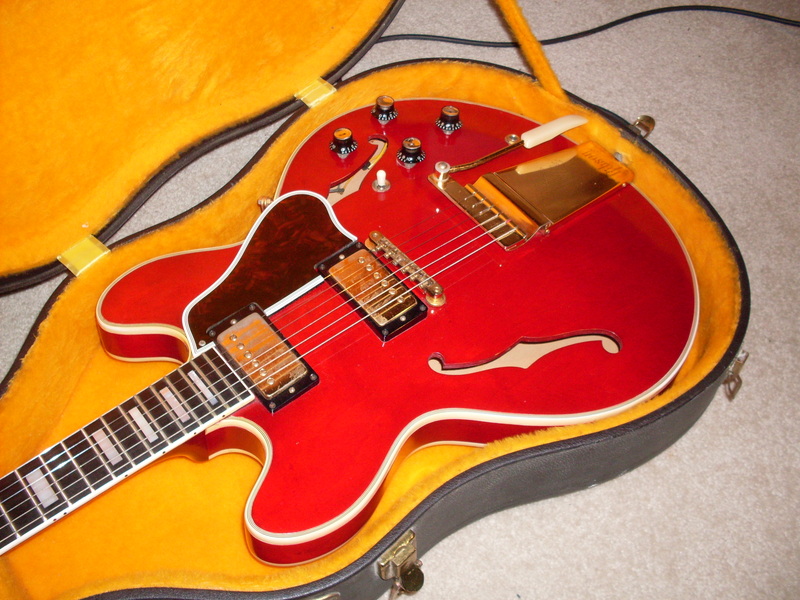 In fact, in the entire ES semi hollow line, the only guitar to decline in sales from 64 to 65 was the ES-355 mono. So a ’65 ES-355 walks in the door. It’s pretty close to mint, the gold is near perfect and I groan when I see the Maestro but it’s a 355 mono and that’s a guitar I always sit up and pay attention to. And besides, they can still play well with a Maestro-they just look wrong to my eye and the string break angle can be a problem if you don’t set it up properly. As soon as I grab hold of the neck, I know this isn’t the typical 65. It’s pretty darn big. Full 1 11/16″ nut and a good .83″ at the first fret. That’s 64 335 territory. Like the other guitars in the line, the very thin necks of 60 -63 were beefed up in 64 and the 355 was no different. It’s just that 64’s are so rare, you never see them. In fact ES-355’s took on a slim profile as early as mid 59, so finding any big neck 355 is a rare thing. 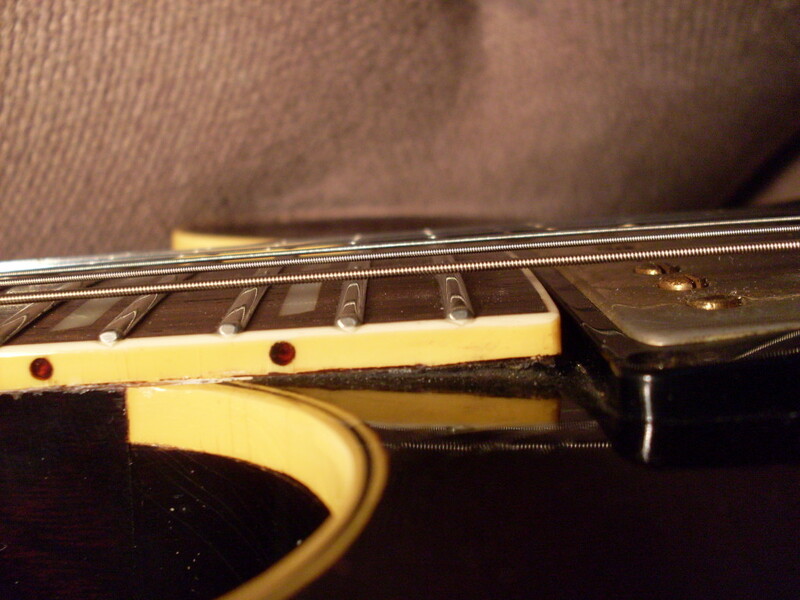 The typical early 60’s ES-355 is more like .79″ or even .78″ at the first fret. A few other things changed in ’65 and they don’t show up on this one which leads me to believe it was built in 64 and wasn’t just a leftover body. It has the very boxy and shallow depth pickup covers-like a PAF cover where the edges are very squared off. It has a wide bevel truss rod cover which says “Custom” on it. The truss cover leads me another possible explanation. Was this a custom order? Gibson would do almost anything you asked them to do in this era. If I called up and asked for a mono ES-355 with a bigger than normal neck profile, they would build it for me. It is a possibility. But it all goes to the nature of Gibson in the 50’s and 60’s… unlike General Motors or Ford, product changes were not made on a calendar basis in most cases at Gibson. And changes in parts were not made on a given day. Everything was transitions over time. But given the odd history of the 355 mono, this one probably is, in fact, a 64 leftover. And a pretty nice one too and I don’t generally like leftovers-just ask my wife. One of my favorites-a 59 ES-335 blonde (natural) played to death and still rockin’. That’s the bottom of the line but, ironically, the top of the price heap. Go figure. OK, all the regular readers are going to groan but don’t. You didn’t always know everything there was to know about these guitars either (nor did I). I get asked this a lot and while it’s as basic as can be, I can understand all the confusion when you first begin to learn about these guitars. The question is, simply, what’s the difference between a 335, a 345 and a 355? The answer, while it seems second nature to many of us, isn’t really so simple. Lets start with the 335. It was the bottom of the ES semi hollow line. What about the 330, you ask. The 330, while also an ES, was fully hollow. So was the 350. A 335 has a rosewood fingerboard (until sometime in 65), dot markers until early 62 and then small blocks, single ply white bindings front and back, nickel plated hardware (until Spring of 65), Kluson tuners and a mono circuit with a three way pickup selector switch. The ES-345 is the middle of the lineup. All ES-345’s have a stereo circuit with a three way switch like the 335 but also a 6 way Varitone switch which is, essentially, a notch filter. The fingerboard is also rosewood but the markers are “split parallelograms”. Both 335 and 345 have the same “crown” headstock inlay, although some say it’s a leaf or a flowerpot. I don’t know what it is. The 345 has gold plated hardware and the pickups are out of phase which, although I don’t entirely understand why, works better with the stereo circuit which sends one pickup to the right and the other to the left into two channels or two amps. A cool setup but not terribly popular these days. Many 345 owners remove the stereo circuit and the Varitone and wire the guitar the same as a 335. The binding on a 345 is three ply (white-black -white) on the front and single ply white on the back. That brings us to the top of the line. The ES-355. The 355 was available in mono like a 335 or stereo with the Varitone switch like a 345. It was different in more than a few aspects. The headstock is larger and the inlay is different. It is called a split diamond and the headstock is also bound around the edges. The fretboard inlays are different too. Not just in shape but in the material. Whereas the 335 and 345 are celluloid plastic, the 355 has real mother of pearl inlays in the shape of large blocks (and has a first fret marker which 335’s and almost all 345’s don’t have). 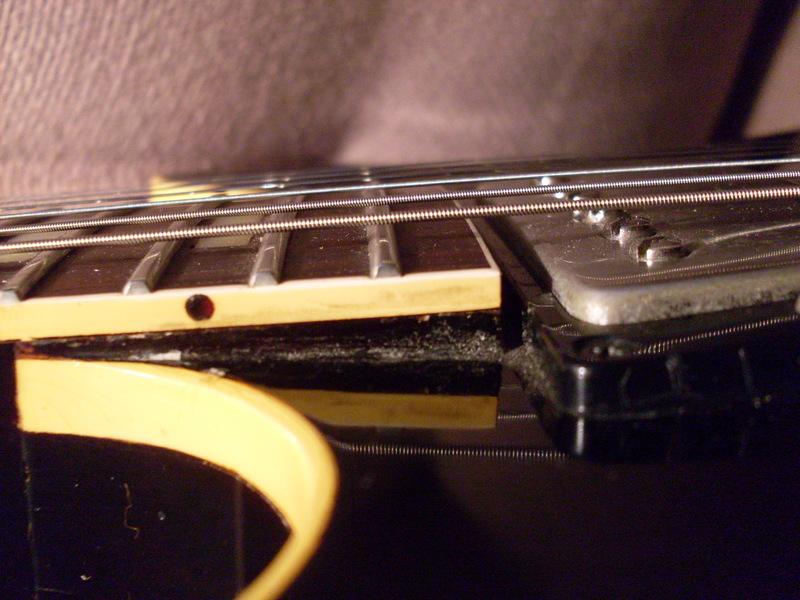 The fingerboard itself is ebony rather than rosewood and the hardware, like the 345, is gold plated. 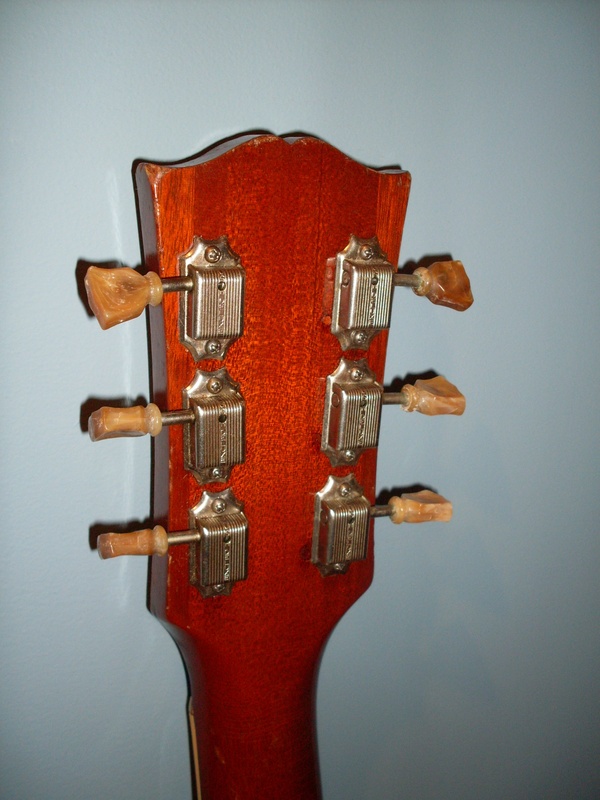 The tuners are not Klusons but Grovers until late 1963 when they switched to Kluson “waffle backs”. The top binding is seven plies (w-b-w-b-w-b-w) and the back binding is 3 plies. Until early 1965, you could get a 335 or 345 with a stop tail or a tremolo tailpiece (Bigsby, then sideways, then Maestro in 63). In 65, they switched to a trapeze to replace the stop tail. A Bigsby was always available even after they switched to the other tremolo tailpieces. However, an ES-355 only came with a tremolo tailpiece unless specially ordered with a stop tail. Stop 355s are über rare and worth loads of dough. As I said, you could always get a Bigsby but the factory stock unit was Bigsby for 58-60, sideways in 61-62 and Maestro from 63 on. 335s and 345s were available in sunburst, red (rare until 61 on 335s), an odd sunburst called Argentine Grey which was neither Argentine nor grey and natural (through 1960). ES-355’s were, unless special ordered, always red. I’ve seen a few black ones, a few naturals, two sunbursts and a white one now and then but 99+% are red. There were custom colors for 335s and 345s as well but they are very rare and quite desirable except for a sort of deep candy apple red that came into being in 65 or 66 called Sparkling Burgundy. I don’t mind it if it isn’t faded but most everyone else doesn’t like it much. There were a lot of changes to all three models over the years and I can’t cover them here-go back and read some old posts and you’ll find all of them . Of course, the three models shared many aspects as well. The construction is the same for all three and the electronics: The pickups, pots and control layout are the same, although the stereo guitars have the extra 6 way switch and a stereo jack and circuit. In terms of the tonal aspects, there really isn’t much difference. A mono ES-355 sounds pretty much like a mono ES-335. Some would argue that the ebony board adds a bit of “snap” to the tone but my ears aren’t good enough to hear it and I have pretty good ears. A stereo 345 sounds like a stereo 355. I won’t get into the differences in tone between mono and stereo because it’s a can of worms. Don’t ask. Look up Varitone controversy either on this site or Google. So pick your fave and buy one. Buy it from me or buy it from somebody else. But I’m telling you, you won’t find a better designed and conceived electric guitar anywhere on Earth. Here’s a bunch of 345’s. The middle one isn’t the usual sunburst, it’s called Argentine Grey although I have no idea why. That switch with the chicken head knob is the 6 way Varitone which causes controversy everywhere it goes. Here’s the top dog (back then). This is a 59 ES-355 mono-note-no Varitone switch. Also note that it has a Bigsby. 99+% of them have some sort of trem tailpiece. If you find one with a stop tail, sell it to me please. Note the different headstock. I did a Google search for Grover CEO and got this pair. 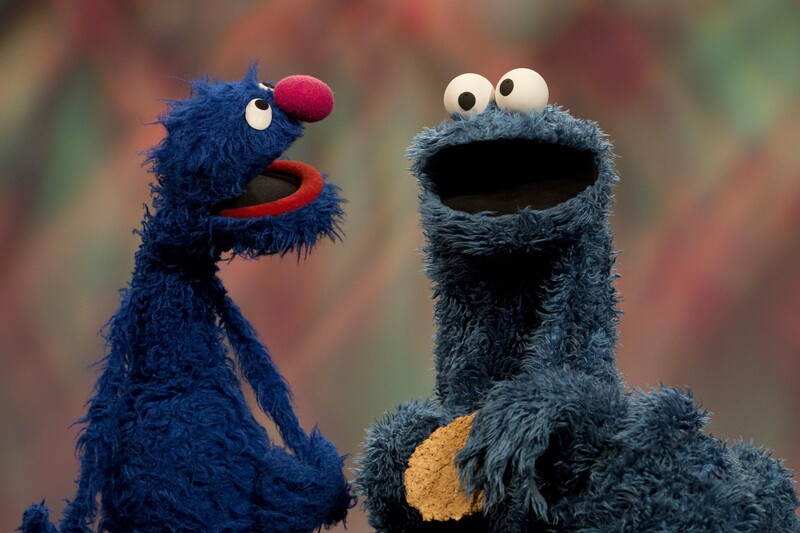 Mr. Grover is on the left and his slightly weirder brother, Cookie Monster, is on the right. He was the CFO if I’m not mistaken. If you ask me which 335 mod is the most frequently seen, I’d have to say tuner changes. 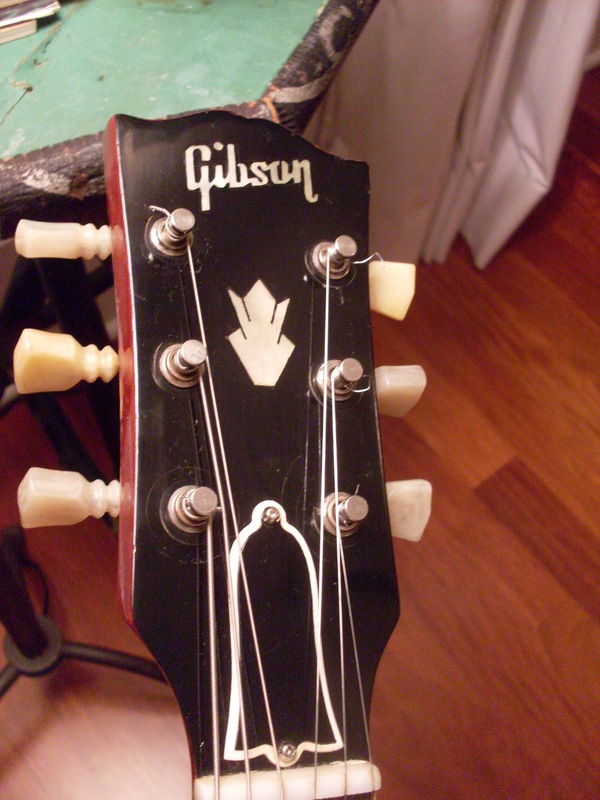 In the mid to late 60’s, it was almost mandatory to put a set of Grovers on your Kluson equipped Gibson guitar . We all knew that Gibsons went out of tune too easily and most of us thought that it must be the somewhat pedestrian Kluson tuners. After all, even Gibson used Grover tuners on the top of the line 355 until 1964 so perhaps they knew something. Most of us know by now that it wasn’t the tuners knocking these guitars out of tune but a poorly cut nut. Usually, the upper strings stick in the slots and go sharp when you bend them. If the tuners were slipping, the strings would go flat. It took me years to figure this out. I changed the tuners on my 68 SG (back in 68) to Grovers for that very reason. A certain Mr. Clapton had a set of gold patent pending Grovers on his 335 and, considering the number of 335’s that have had these tuners, I would say it was all the rage back then. Then the 70’s brought Schallers which on the plus side are perfectly good tuners but on the minus side, are heavy and ugly and required more holes. At least with a set of Grovers, you could use the existing bottom hole from the Klusons and only have to enlarge the shaft hole. But the damage was done, as they say and now we have to deal with it. My initial thought, with a set of Grovers, is to leave them be. They are good tuners and they look OK. A Grovered Gibson will be a perfectly serviceable guitar but the purist collectors will always discount them (or turn up their collective noses at them). Put a set of Klusons back on with a good set of adaptor bushings-the ones that are “invisible” because the size of the part of the bushing that shows is the same as the real ones and you’re back to collector grade. Sort of. The shaft holes will always be bigger and you can’t hide that (and you shouldn’t). You can repair them but the guitar will always have an issue. So, how do you price an otherwise collector grade guitar that’s been Groverized. Or Schallerized. Or perhaps Sperzelized. well, it depends on the guitar. 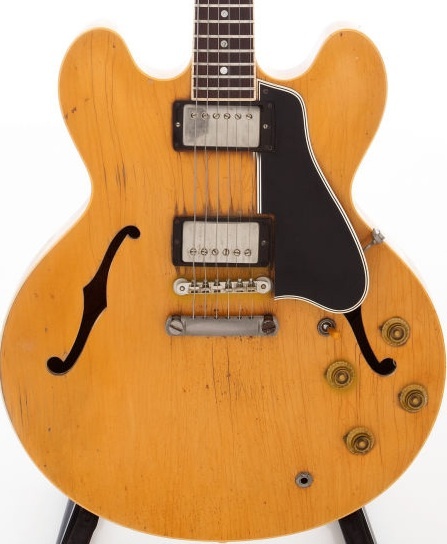 You might knock $4000 or more off a $40,000 ’59 but on a 66 ES-335, it might only be $1000. It also depends on how clean the front of the headstock is. Most folks seemed to think you had to tighten down the bushings until the headstock dented. Those marks won’t go away and they diminish the original look. Knock off a few more bucks. Schallers leave an extra hole that will peek out the sides of a set of Klusons. Knock off another few bucks. There really aren’t any rules and that’s what can make buying any vintage guitar a tricky business. My approach is to look at the whole guitar. If, for example, it’s a player grade guitar with changed parts, Bigsby holes and perhaps some player wear, then don’t worry about the Grovers. It’ll be priced in. But if the guitar approaches mint condition with the only issue being the Grovers, then you may be paying a serious premium (for a mint 335) but ending up with a guitar that will always be a cut below an all original one-even one in way worse condition. As I’m fond of saying. Fifty years is a long time for anything to remain unmolested. If the only issue is a set of Grovers and the price is right, then I say go for it. You could find a lot of worse mods than a cheap tuner swapped for a better one. The dreaded “Grover Shadow” that surrounds the Kluson shaft on a 335 returned to its original tuners. Even with adaptor bushings, you can’t run from the shadow. See those little filled holes on the edges of the tuner housings on the right? Schallers. They have an offset mounting hole so you didn’t have to use the existing holes. You just drilled new ones. It’s just an old Gibson. Who cares! Got your attention, didn’t I? I keep reading (on that newfangled interweb) that as soon as the baby boomers (like me) get to be too old to play their vintage guitars, the market will tank and nobody will care about these guitars any more. That is crap, to put it gently. I approach this belief from two positions. First, how old do the folks making these statements think we are? 95? The oldest of the boomers are now around 68 and the youngest, according to most folks who keep track of this sort of thing, are 50. The first question that comes to mind is at what age do the doom sayers think we are going to stop playing? BB King is 88. 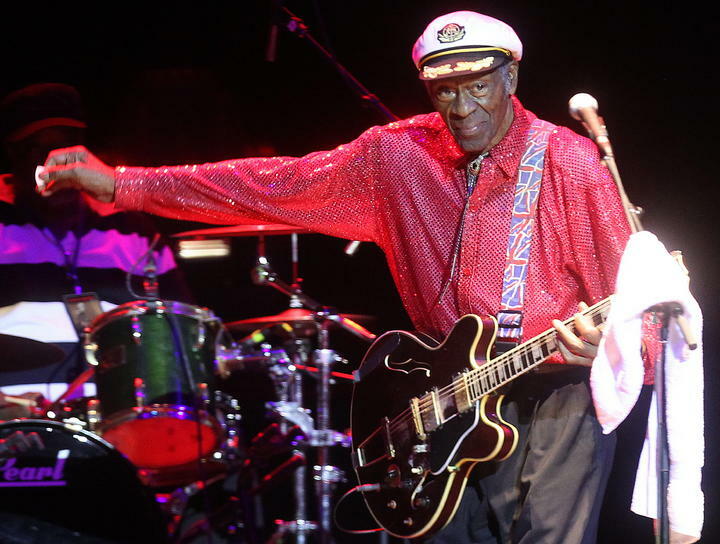 Chuck Berry is 87 and Buddy Guy is 77. None of them appear to be giving up the guitar until the grim reaper comes to call. The overwhelming majority of my vintage clientele are between the ages of 50 and 65. So, does that mean the market will tank in 30 years or so? If so, then that’s long enough for me. I hope I continue to play until I die at the ripe old age of 95 or so. My father lived to that age and while he didn’t play the guitar, he would have been capable of doing so almost to the end. I don’t think many of us boomers are thinking of hanging up the old ax any time soon just because we’re getting up there in years. Beyond dumb statements about the baby boomers getting too old to play (and buy vintage guitars), what about upcoming generations of players? Certainly a part of what makes our favorite guitars our favorite guitars is that these were the guitars of our collective youth. The generation after us wasn’t even born when the Beatles hit The Ed Sullivan Show in 64. That brings me to my second approach to the issue. The generation behind us grew up in an era of Norlin Gibsons followed by pointy headed Superstrats and BC Rich’s. Hamers too, I suppose and Ibanez’. Are these the vintage treasures of the future? Could be but I don’t think so. I think that, ultimately, there will be an ever increasing appreciation of the guitars that we love so much-Les Pauls, 335’s, Strats, Teles, SGs and so many others built between the early 50’s and the mid 60’s. I base this partly on my experiences with younger buyers. Many, between the ages of 25 and 45 were influenced by their fathers (that would be us old guys). My son, who was born in the 80’s, is drawn to older guitars but not necessarily the same ones we like. He likes Jazzmasters and Jaguars but he plays a Nash Telecaster. I spoke not too long ago with Ben Taylor of Southside Guitars in Brooklyn (home of the current hipster population including my son) and asked him what that generation is playing. “Cheap stuff but good cheap stuff. They don’t have a lot of money for the high end guitars.” True enough but he went on to note the same thing I did-they like the old guitars but gravitate toward the ones that are more affordable like Jazzmasters and Jaguars and maybe Guilds and Gretsches. You know, the ones that are incredible bargains when you look at quality versus price. Maybe they’re smarter than we are. We tend to gravitate toward the most expensive ones (who here doesn’t want a burst?) but there are great, great guitars from the 50’s and 60’s that don’t command prices above $5000. You can get a 60’s Guild Starfire for under $2000. A 60’s Fender Jaguar for around $3000. A Guild Duane Eddy for under $4K. 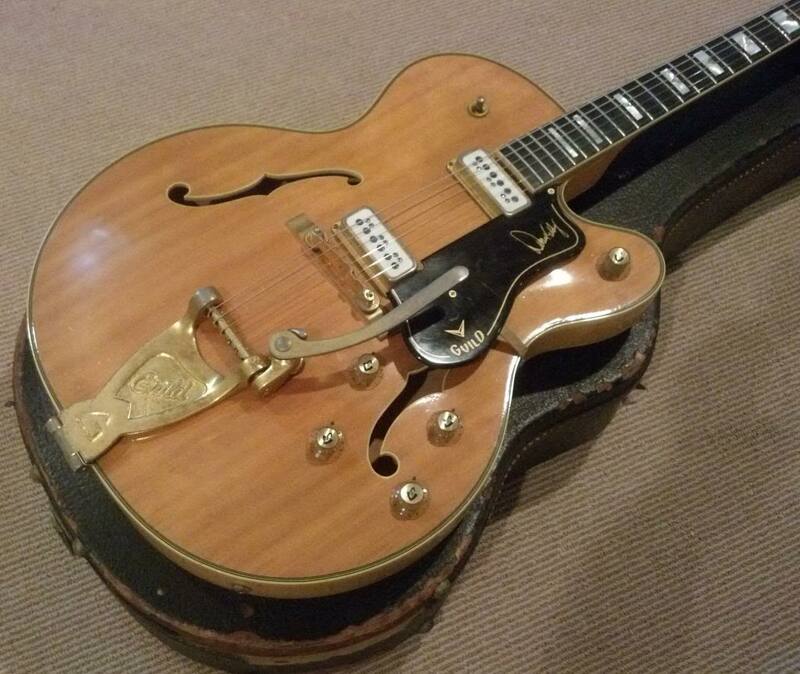 How about a mid 60’s Gretsch Gent or Nashville for under $3K? These aren’t the guitars that collectors are after but they can be incredibly good guitars. They were in high demand back when I was a kid. I would have killed for a Gent back in 64. They just didn’t become the big money collector guitars. With new high end reissues pushing $5000 (and above), I would hope to see a resurgence of these great old classics among the next few generation after us old farts. Eventually, more of them will be able to afford the wonderful instruments that we are currently playing and perhaps even more of them will inherit them when we’re gone. But don’t hold your breath. I’ll be playing for at least another 35 years or so. This 64 ES-335 shows a bit more than an equal amount of neck under the fingerboard as there is fingerboard. This is a pretty typical neck angle for a post 1960 ES-335. 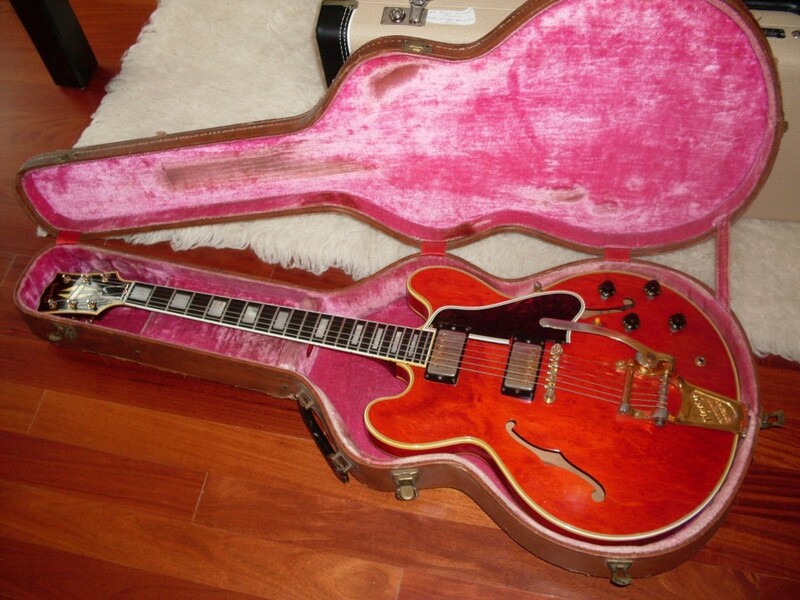 Here’s an early 59 ES-345 that shows a lot less wood under the binding meaning the neck angle is shallower. Some 58’s show no neck at all under the fingerboard. This angle affects how low the bridge needs to be for the guitar to set up properly and comfortably. This is a difficult subject because the effects of various neck angles are impossible to quantify. By neck angle, we’re talking about the angle at which the neck meets the body of the guitar. The easiest way to see this is to look at how much neck is showing under the fingerboard at the area where the neck overlaps the guitars top. A shallow neck angle would mean there is very little neck showing and the most visible result of a shallow angle is that the bridge sits very low on the guitar. A steeper neck angle (raked toward the back of the guitar) will result in the bridge that sits higher off the guitar body. But there’s more to it than that. A shallow neck has a larger area of contact with the body than a deeper angle. Not by much but there are plenty of folks who believe the guitars with the shallow angle sound better. But, again, that’s not the whole story. Let’s look at the most notoriously shallow angle on a 335-the 1958. The neck angle on many (and most) 58’s was so shallow that they needed a thinner bridge to allow a decent string height (action). Those bridges quickly collapsed and Gibson started shaving full size bridges to accommodate that angle. But a bridge that is set as low as it can go actually sits on the guitar top so there is more area of contact than there would be if it was sitting only on the bridge posts. Does that make a difference in tone? Beats me, but it certainly will translate more vibration to the top of the guitar because there is more metal in contact with the top. It’s like when you are sitting in a chair playing (without the amp) and the guitar makes contact with the arm of the chair and all of a sudden, your guitar gets louder because the chair starts vibrating along with the guitar. The question is whether this actually translates into a better sounding guitar. I really like most 58’s. But I really like most 64’s too. They don’t sound the same but I can’t say the shallow neck angle on a 58 makes the difference. It could be the bigger neck on a 58 or the PAFs or the thinner top. There are just too many variables to make some kind of general statement. You can certainly make the argument that more wood equals more vibration equals more tone. That would suggest that big necks might sound better than small ones. Experience doesn’t bear this out with any degree of certainty. I’ve had thin neck 62’s that sound as good as any 59. Similarly, I’ve had just OK sounding early 60’s with a steeper neck angle, a fat neck and PAFs. Throw in variables like poorly cut nut slots, over notched bridge saddles and poorly adjusted truss rods and any 335 can sound worse than it should. These guitars are, quite simply, the sum of their parts. If, at some point, I get two totally well set up, similarly equipped. same size neck 335’s -one with a steep angle and the other with a shallow angle, I can do some kind of side by side. But for now, I will go with my gut and say that the difference is real but it is probably overshadowed by all the other parameters. This is the bridge on my 59 Epi Sheraton which follows the same rules as a 3×5. 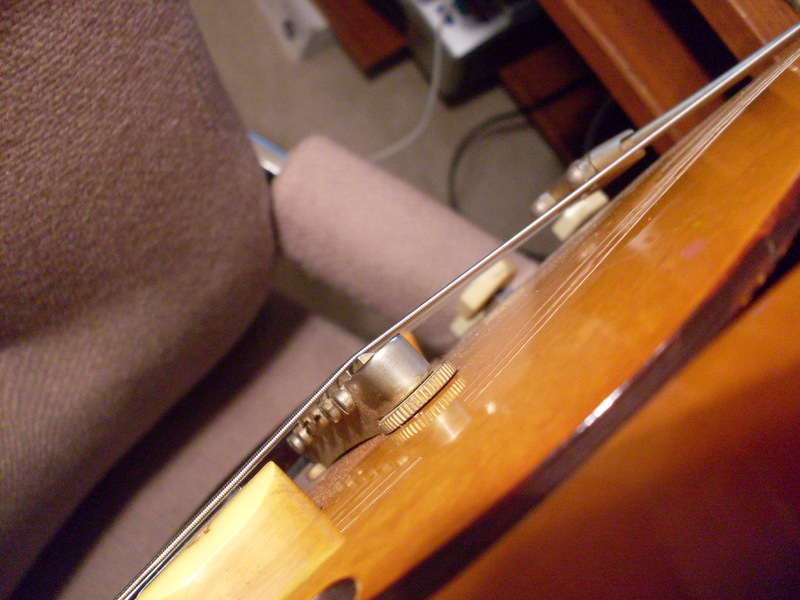 It has an extremely shallow angle and the bridge sits as low as I can get it, touching the top of the guitar. This could be a good thing.